Sean Noonan was still high on Cloud Nine when the Inishowen Independent caught up with him after Sunday’s minor semi final. Smiling broadly, his face was flushed after 20 glorious minutes of celebrating, back slapping, hugging, cheering and laughing. 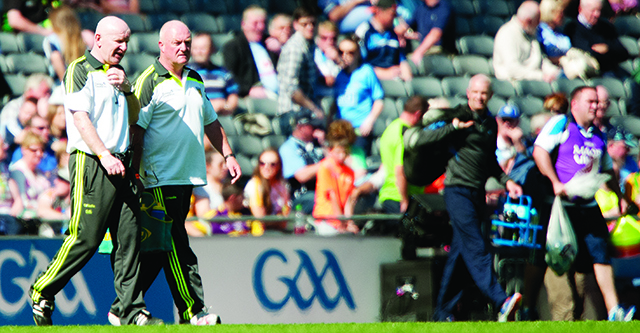 With Declan Bonner, Sean Noonan had targeted winning the All-Ireland title. Their season was broken into three stages. Win the Ulster Minor League. Accomplished. Win the Ulster Minor Championship. Done. Win the All-Ireland minor championship. They are just 60 minutes away from that. Bonner and Noonan knew how big Sunday’s task would be, and the one to come on 21 September, but they have great faith in their squad of players who, three years after they were first brought together, have never lost a competitive match. “I am delighted that this group of players have got what they deserved, have made history,” Noonan said. Dublin were a “top class side”, he acknowledged. Noonan described the switch of his clubmate John Campbell to full forward as the pivotal move of the match. “Switching John Campbell to full forward was the most important one we made in the course of the game,” he said. That Donegal came back from a poor start – they trailed by 5 points to 1 after 20 minutes – is a testament to their mental strength, something the management have emphasised and worked hard on with the players. “We have worked hard with our players on their mental strength,” Noonan acknowledged, referencing Anthony McGrath. “We’ve taught them that if they miss a score, or a tackle, that they are to put it behind them and move on. “We did miss chances, but that mental strength came to the fore and the players were able to put it behind them. The crucial winning score came from the boot of Glenties’ Ethan O’Donnell. O’Donnell is one of the brightest young stars in Donegal football, and has been used effectively as an impact sub throughout the campaign that has seen Donegal defeat Derry, Antrim, Armagh, Roscommon and now Donegal. And use of the substitutes bench was something Donegal had given a lot of thought to. “Everybody talks about how draining it is to play in Croke Park,” Noonan said. “It was really hot out there today and therefore even more draining. So it was important to bring on fresh legs, and we had discussed that in advance. Now, there’s a little over a fortnight to prepare for the All-Ireland final in front of another 82,000 sell out crowd in Croke Park. “We have three weeks to go, and it doesn’t get much better than playing Kerry in an All-Ireland final. “I’m looking forward to getting back to training on Tuesday night. He leaves the question hanging. For more all Ireland coverage click here.